The La Sal Mountains house a growing network of connecting trails. The cooler temperatures, alpine trails in varying degrees of difficulty, fewer crowds, woodsy smells are irresistible. 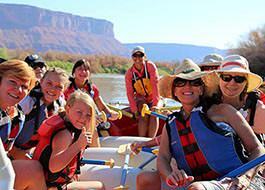 Plus, the phenomenal views of majestic peaks above and the contrast of red Moab below, makes the La Sal Mountains a bikers paradise. 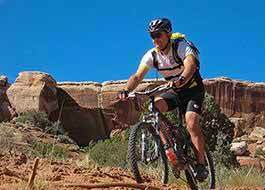 Some of the most phenomenal mountain bike trails begin in the La Sal Mountains. If you’re looking for a way to beat the summer heat and still get on an incredible ride, take a spin on some of these recommended rides. Depending on your vehicle and ambition level, you can begin the trail at Geyser Pass, Oowah Lake, or the Burro Pass Road. This trail as a steep ascent that covers Jeep trails and singletrack. 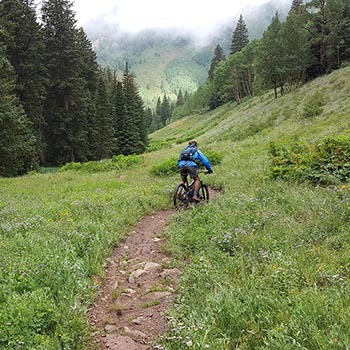 A classic La Sal Mountains ride, achieves an altitude of 10,500 feet and features difficult, narrow singletrack. Fun downhill ride with great views, and hairpin turns through some sections. Single-track trails, steep ascents and descents and technical terrain. It has spectacular views of the area and you can take a deserved break at the Squaw Springs. This is a difficult single-track trail with steep descents, patches of slickrock, and, of course, magnificent views. This trail is favored by hikers, bikers and equestrians. About 1 mile of single tracks at about 9,300’ of elevation. This iconic single track trail starts at the Burro Pass Trailhead, merges with the Kokopelli Trail, and ends at the Colorado River via Porcupine Rim. Recommended for the more advanced mountain bikers. The La Sal Loop Road is a 62 mile challenging loop with outstanding views of the La Sal Mountains, red rock formations, Castle Valley, Moab, and the Colorado River. The highest elevation reached is about 8,300’. Along the road you will see several types of vegetation: desert shrubs in the lower elevation and aspens and Pinion pines the higher you reach. Be prepared with everything you may need as there are no services (only a few portable toilets along the way), and cell phone reception is irregular and inconsistent.